What a great weekend for an art show! The weather was sunny on Saturday and pretty decent most of Sunday. It rained a bit towards the end, but stopped by the time we had to pack up. Thanks again to everyone who came out and supported the local artists. I had tons of fun, made a few sales, and saw some breath-taking artwork! The most memorable aspects of the show for me, however, were my interactions with other artists and customers. One particular connection stands out in my mind, and I would like to share it with you. It was early Saturday morning, and the day was just beginning. Customers were walking in, looking around, and smiling like kids at a carnival. Nick, a young man probably no older than 18 or so, steps into my booth, looks around, and introduces himself. He says he’s helping his father at a nearby booth. He looks at my work with interest and tells me he has a strong interest in landscape and nature photography. I offer some advice about technique, gear, and the business of photography in general. We exchange a few pleasantries and he leaves my booth. Throughout the day, as Nick passes my booth, he says a quick hi or waves his hand, every so often stopping to re-examing my photographs. I forget exactly when, either at the end of Saturday or on Sunday morning, Nick buys a few greeting cards from me, one of which is the opening image of this blog. Just before Cindy and I close up shop on Sunday evening, I see Nick again. He’s holding the Mt. St Helens image in his hand with an eager expression on his face, like a student who know the answer and can’t wait to give it. With a thrill in his voice, Nick tells me that he had bought the picture for his mother, because, for some odd reason he couldn’t describe, it strongly reminded him of her. Nick had discovered from his father later that day, Mt. 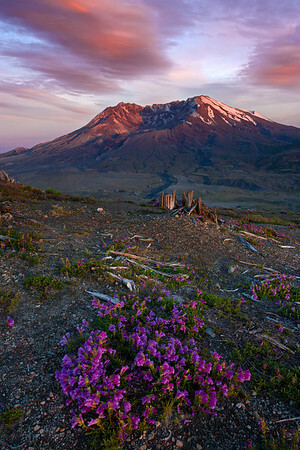 St Helens erupted on May 18th, coinciding with his mom’s birthday! It did my heart good to see such joy in Nick’s voice as he recounted that experience. He was smiling from ear to ear as he walked back. Interactions such as this is what will remain with me, more so than any sale, profits, or losses. I don’t know if Nick will ever read this blog, but if he does, I hope he leaves a comment and describes his feelings himself. The next show is July 17th/18th, and I can’t wait!